Liam O’Connor, Maddy Carter, and Sal Vikram all should have died. But instead, they have been given a second chance—to work for an agency that no one knows exists. The TimeRiders’ mission: to prevent time travel from destroying history—and the future. . . . When Maddy mistakenly opens a time window where and when she shouldn’t, Liam is marooned sixty-five million years in the past, in the hunting ground of a deadly, and until now undiscovered, species of prehistoric predator. Can Liam make contact with Maddy and Sal before he’s hunted down by dinosaurs, and without changing history so much that the world is overtaken by a terrifying new reality? The second book in the thrilling TimeRiders series is just as fast-paced, intelligent, and mind-bending as the first. 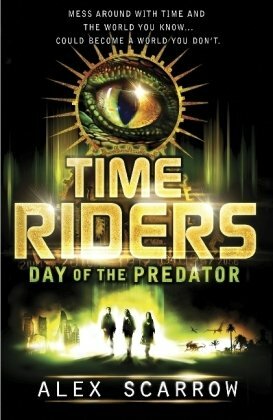 I loved the first book in the Time Riders series, and the second was even better! The thing that sticks out to me in these books is how well-researched they are. When dealing with advanced scientific technology and historic details, a lot of research is needed, and Scarrow has clearly spent a lot of time making sure to get the facts straight. Not only does he get them straight, but he explains the science in a way that the average teen will understand what's going on, while also managing to not "talk down" to his readers. Along with the science of the time travel being interesting, this book was action packed and perfectly paced! I kept turning the pages because I needed to know what was going to happen next. There was never a dull moment. I especially loved seeing how what happened in the past affected the present. Along with being incredibly creative and attuned to the scientific details of the story, Alex Scarrow is a magnificent writer. Some of the scenes were brilliantly done, such as the ones from Broken Claw's perspective (I imagine it must be difficult to get inside the mind of a primitive lizardy caveman creature! ), and the scene where he showed the progression of time and how certain objects made it from the Cretaceous Era to the present. Scenes like those make this book even more unique than it already is, and also made me think about time and evolution and all that fun stuff. If you're a fan of time travel stories, then Time Riders is a must read! I can't wait to see what new adventures await the Time Riders as the series continues. Enjoy all your new reads! These are new to me. Really kind review Michelle, thank you! Glad you enjoyed it so much.